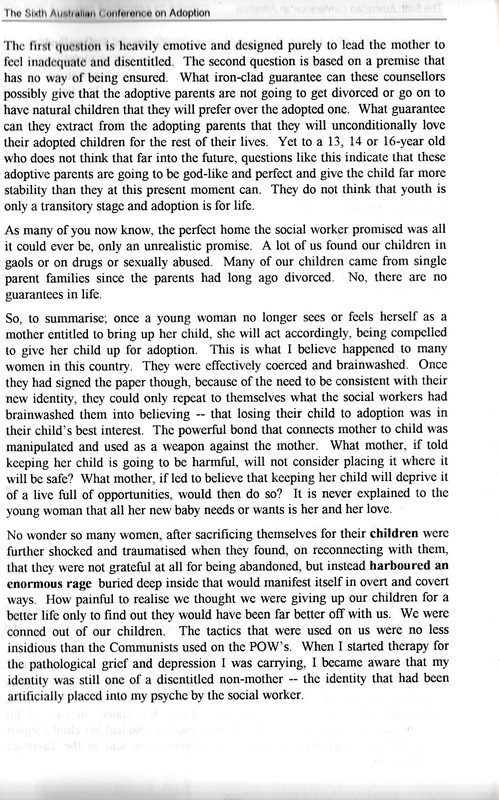 Below is the talk I presented at a forum organised by Jan Barham (MLC) Greens primarily to educate her parliamentarian colleagues about the issue of past Forced Adoption. This was a direct outcome of the successful passage of her motion through the Upper House in NSW that provided support for a Day of Recognition and a Memorial. 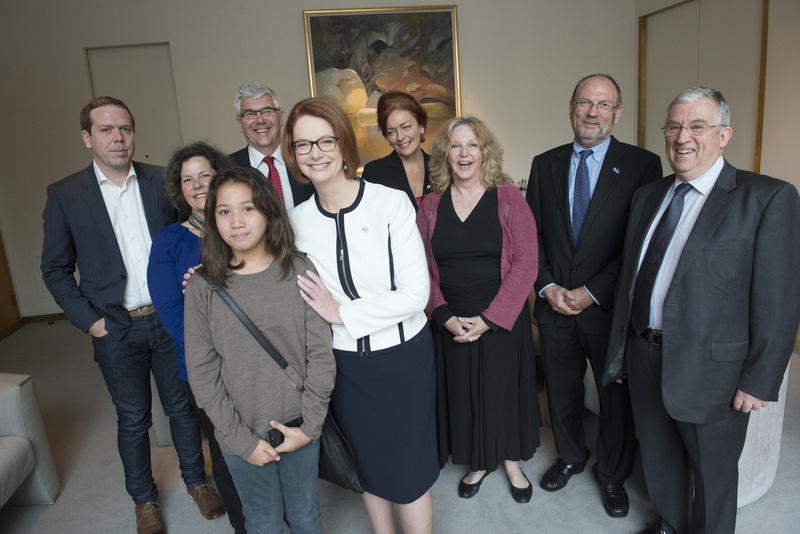 Jan’s stated intent: “So that the NSW apology to survivors of Forced Adoption is never forgotten”. Personally I am so grateful to Jan for all her hard work on our behalf. “What a team you guys make – I have been deeply moved”. I would like to start by saying as a society we need to learn the lessons of Forced Adoption. To do this we need to know what was apologised for and who the apology was too – this is very important because many mothers, and I am here to speak primarily on behalf of mothers, are being re-traumatised by the current promotion of adoption by movie stars and the linkage now made with it and child protection. Additionally it is disturbing that a caveat is given whenever our apology is mentioned. For instance the apology is often prefaced by stating that adoption for many was a wonderful experience and is an important tool for child safety. The apology was not given to those who had a wonderful experience. It was for a traumatised minority that still suffer today. Further, I would like to put it on the record – We did NOT have our children removed because of abuse, but because we were unwed. Adoption in the 1970s was not promoted as a child protection measure, but rather that it was in the child’s best interests to be brought up by a white, married couple. We were apologised to because our newborns were brutally and forcibly taken and hidden under a cloak of secrecy. We had no rights, and were made invisible by policy, practices and legislation. This is the adoption we know. Therefore I would like us to rethink the use of a word that has such painful connotations. If the separation of a child from its family is necessary for its safety then maybe other words could be substituted for adoption – such as ‘Permanent Guardianship’. This would help to distinguish current child placement practice and legislation from that of the era of past Forced Adoption. Even the term Forced Adoption needs to be understood more broadly. I suggest that many people perceive it as an institution that had the child’s best interests at heart and was a decision made by a young mother and her family after reflection on other options and because of an intolerant society. This narrative does not reflect the phenomena of Forced Adoption experienced by hundreds of thousands of Australians, When I first began campaigning in 1994 I referred, as did many others, to a stolen generation of white babies. I did not want our experience to be reduced to a debate about the pros and cons of adoption. I saw myself as a civil and human rights activist. I saw what happened to me and other mothers as a flagrant abuse of our rights as Australian citizens. It is worth considering that thousands of newborns taken were not adopted. These babies were designated by medical staff or social workers as not being “perfect enough” – so were fostered or even put into institutions. This was not an insignificant number, around 21% each year. So one in every 5 babies taken were not adopted. As well babies died before being adopted or the adoption order was finalised. Some mothers were falsely told their babies died and when laws changed and their now adult children sought them out they found that their signatures on adoption consents were forged. The apology that former Prime Minister Julia Gillard and former NSW Premier Barry O’Farrell gave was for the policy, practices and legislation that enabled the needless tearing apart of mothers and babies. For the cruel and barbaric measures inherent in the forced removal regime. If the true reason for the high number of forced adoptions is not known or misapplied then adequate social structures can not be put in place to ensure that it never happens again. For instance social mores is often cited as the reason babies were taken. This is not true. They were taken because of the use of cruel practices, such as the separation at birth of mother and child and forbidding the mother any access to her baby. This effectively traumatised the mother into silence. These practices were not known by the broader society, but purposefully hidden. The media was used as a tool of deception. Newspaper articles reported that our babies were unwanted. There was nothing in the press about the use of mind altering barbiturates to keep us docile, or the use of restraints during birth to hold us down. The pain of a distressed mother crying for her taken infant remained a secret. How many of you here knew that mothers were drugged and held down during the birth? That we had pillow or sheet held up in front of our faces so that we could not glimpse our newborn at the birth? How many knew that we were often transported miles away from the hospital without our babies, where they continued to keep us stupefied with drugs? Or that we were not allowed to leave the hospital until we forced to sign an adoption consent and if we did try to leave we were threatened with police action? The social mores argument is a ploy to shift blame from the culpable. The abuses did not stop because society from one year to the next became more tolerant. They stopped because mothers got mobilised and started to speak out and members of society learnt about this unholy business and joined forces to stop it. Once they stopped denying us access to our babies at the birth, and stopped the use of drugs and pillows, the number of babies for adoption plummeted. During the NSW inquiry into past practices in adoption Justice Richard Chisholm stated that it was not social mores, but rather the deceptive and cruel measures used to separate mother and child. He also stated that they were as illegal back in the 1960s and 70s as they would be today. Australia may have been more conservative, but I doubt the majority would have condoned such cruelty, nor was such treatment considered part of our normal cultural life. The pro adoption lobby talk about the need to be careful “not to tarnish adoption” when apologising for abuses that occurred in the past– the reality is that adoption is already tarnished. It is tarnished by the abusive practices and cruel laws that ran in tandem with its evolution. It is tarnished because as an institution it used secrecy and lies to cover up the most barbaric of practices. 17% of the indigenous stolen generation were stolen from their mothers from the same hospitals and by the same adoption agents as were the non-Indigenous. Nearly one in 5. 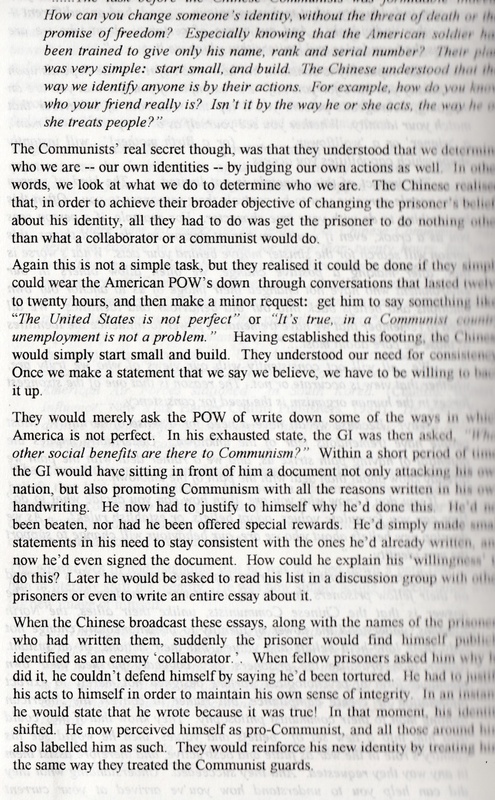 Getting language and terminology right is a practical measure that supports the apology process. And practical measures are what I will now speak on. The formal expression of regret through an apology offered by the State to those it has harmed is only the beginning of the journey. NSW has taken this first step.. However, an apology cannot sit in a vacuum it must be followed by practical measures otherwise it becomes meaningless. If our apology is not put into a context of learning from past mistakes, if it is not appropriately remembered and reflected upon so everyone truly understands what happened and how survivors of Forced Adoption suffered then it can cause more harm than good. After an apology, the expectation of individuals wronged, is that it is followed by something practical that makes it tangible – so it is not perceived as an empty gesture – but one that was genuine and heartfelt. It is expected that measures be put in place to ease the pain felt, which for some has been 40 or 50 years of their lives. Pain caused not by any wrong that we committed, but by an oppressive state apparatus, the very entity we as citizens expected to protect us. This is particularly repugnant in a country that prides itself on equality for all. The state puts in place structures that ensure none of its citizens become a dehumanised minority without rights or what rights they do have are violated with impunity – as happened to us. Such a body maybe an organisation or an entity like an Ombudsman, where individuals can go and be heard – and something is done to stop the violations and action is taken against the perpetrators. That representatives of government and non-government organisations with far ranging powers such as social workers and adoption agents are made accountable for their actions. That the media is not allowed to report misinformation and purposefully stigmatise a minority group, or participate in hate mongering. If it does there must be an independent ombudsman, with judicial powers, to whom this inciting to hate can be reported. An uncritical media should not be allowed to be used by the powerful to promote their vested interests through misinformation. If it does there should be a body to which it can be reported and has the power to take action and hold it and its representatives accountable. To make these accounts part of the National Archives of Australia History of Forced Adoption project. These accounts do not belong to the NSW government they belong to all mothers across Australia so the real history of Forced Adoption is finally told. A service independent of adoption where the mental health providers are trauma specialists and understand that what I experienced was akin to torture and has impacted on every level of my being. An integrated birth certificate: A birth certificate that accurately details the true account of the adopted person’s birth and is able to be used as a legal document. The birth certificate adoptees use is the only legal document that is allowed to lie. It states they were born to a couple who are not biologically related to them. The biological parents are rendered invisible. Adoptees have fought hard to get access to their true birth certificate and now they want to be able to use it legally. It has been put to governments around Australia including NSW that adoptees be allowed to have an integrated birth certificate. One that accurately identifies their original parents as well as their adoptive parents. Not being included on your son or daughter’s birth certificate has lifetime ramifications for mothers. A stranger and not as a Grandmother … I AM LEGALLY INVISABLE! … The truth needs to be acknowledged. My family needs to have their true heritage and true history protected for my grandchildren’s sake and all family that follows. While I am grieving my son’s death, I am also trying to deal with the loss of not being related to my own family and I cannot accept this. It is cruel and morally wrong. Margaret wants not only an integrated birth but a death certificate to accurately record the true details of her son’s identity. The education of our community is imperative. The horror of what happened to us needs to become part of the high school and university curriculum. Students who one day may become doctors, nurses, psychologists need to know about the trauma and the pain experienced by such a large proportion of the population. People they may be required to treat. They need to know how deep the trauma goes. That the NSW government ensure that its State Health and Social Services Departments disseminate the Health Fact Sheet amongst health providers – to provide preliminary information to assist those we may seek out for help while waiting for more comprehensive services to be implemented. So that NSW never forgets and never repeats its past mistakes to its most vulnerable a day of recognition of its apology must be remembered. The incredible loss and suffering of mothers and their children needlessly torn apart must be acknowledged. A day when we can come together to remember, reflect and learn. This is why a memorial is so important. It provides a focal point for reflection of what has occurred, why it did and what were the affects. A place for mothers and their taken children to come together and support each other and be supported by our wider community. This is a potent and very necessary part of our healing process: Remembering the loss together and having it acknowledged by others. Having a sense that what happened is regretted by all and that there is in place a tangible reminder acknowledging that loss ensuring it will be remembered. A memorial is a deeply symbolic gesture. In our case it speaks to us and says our State acknowledges that its past laws, polices and practices caused us pain, grief and loss and on behalf of the community it says we are sorry and we want to share the heavy burden you have carried alone for so long. Lest we forget are 3 very powerful words and in this case that the forcible removal of more than 70,000 babies from their mothers by NSW state representatives was an act so reprehensible it needs to be remembered and shared on every anniversary of the apology that was given by the NSW government on the 20th of September, 2012 at a memorial site provided by our government. I would like to conclude by talking about the isolation we as young women felt. The loss, grief and sense of betrayal we suffered. These feelings have been with us for our entire adult life. It is absolutely paramount that our community knows the depth of our agony and that of many of our taken children, now adults. It is imperative, that as a nation we never, never, repeat the mistake of isolating a minority and exploiting it to meet the demands of the more powerful. The exploitation of the vulnerable not only affects the exploited, but becomes embedded in the social fabric and in time becomes a pain that seeps through the nation. Our pain is not confined to us the immediate survivors, but is passed down the generations. There are many impacted by forced adoption not just us the mothers and our taken children, but our extended family, our subsequent children and grandchildren. We no longer want to feel alone. We want our society to join with us in remembering the grief, loss and terror we felt. A Day of Recognition and a Memorial are intrinsic to our healing process and further steps on our journey towards reconciliation with the broader community from which we, for so long, felt alienated. 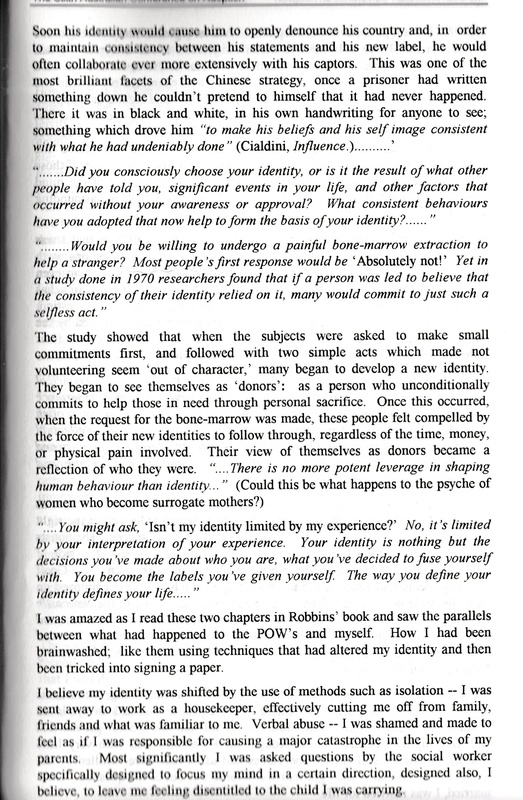 This entry was posted in My Articles and tagged Adoptee, Adoption, Christine Cole, day of recognition, Forced Adoption, Forced Adoption Apology, forced adoption memorial, forcibly taken, Jan Barham, Kerri Saint, mothers, stolen generation, white stolen generation. Bookmark the permalink.